On March 4, 2013, U.S. Deputy Chief of Mission in Rwanda Jessica Lapenn, President’s Malaria Initiative Resident Advisor Francisco Saute, and leaders from the Rwanda Ministry of Health visited the Africa Indoor Residual Spraying project (AIRS) office and work sites in Bugesera District, Rwanda to learn about how the project is protecting approximately 1.5 million Rwandans from malaria in 2013. While visiting the indoor residual spraying work site in Ruhuha Sector, the delegation observed a spray operator interact with a woman whose house was targeted for spraying. The spray operator informed the woman about the dangers of malaria and how IRS could protect her family. The woman needed little convincing. “In the last five years I have not had any malaria cases in my family including my children and this is due to the spraying done every year and the mosquito nets we get from the government. We are so happy to have this activity taking place in our home and we are grateful to the Government of Rwanda and the American people,” the resident told Ms. Lapenn. The Deputy Chief of Mission, USAID and Ministry of Health officials met with Ruhuha Sector health authorities and community members. The Vice Mayor thanked the deputy mission chief for the U.S. government support. He reported that malaria has significantly decreased from 40 percent to 14 percent in Bugesera district and it stands at only 10 percent in some sectors due to interventions such as IRS, mosquito nets, and promotion of household hygiene. 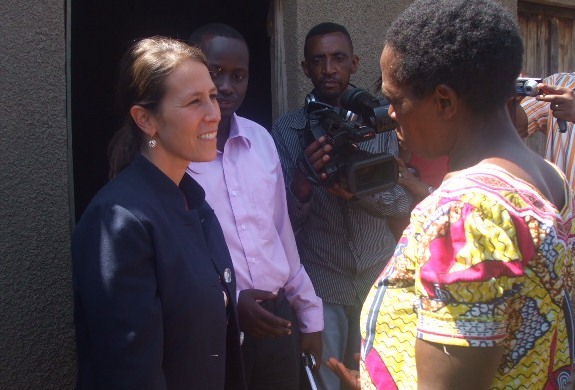 Ms. Lapenn emphasized that support from the government of Rwanda and the community is critical to the success of USAID health programs. She praised the government of Rwanda for embracing malaria elimination and reaffirmed the U.S. government’s commitment to malaria control in the country. Dr. Uzziel Ndagijimana, permanent secretary at the Rwanda Ministry of Health, reiterated that malaria in Rwanda has been combated due to good government policies, different partners and the US government specifically. He specifically noted that USAID deserves to be applauded by the community for their dedication to malaria prevention. Dr. Ndagijimana concluded by thanking spray operators, district and sector authorities, and the AIRS team for providing an excellent service to the communities.